Greenhouse Fabrics: Durable..Stain Resistant..Easy to Clean! 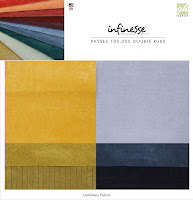 We are excited to introduce our new MICROFIBRES INFINESSE collection in book D11. This performance fabric is durable, stain resistant, and easy to clean...perfect for families with children and pets! Visit www.greenhousefabrics.com to Shop the Infinesse Collection now! Check Out Microfibres Video to see EXACTLY what we are talking about!